Shaun J. McLaughlin believes every writer must be in it for the art, and strives to make his writing stand out from the rest. Shaun discusses his success with blogging and what he believes it takes for a writer to succeed. 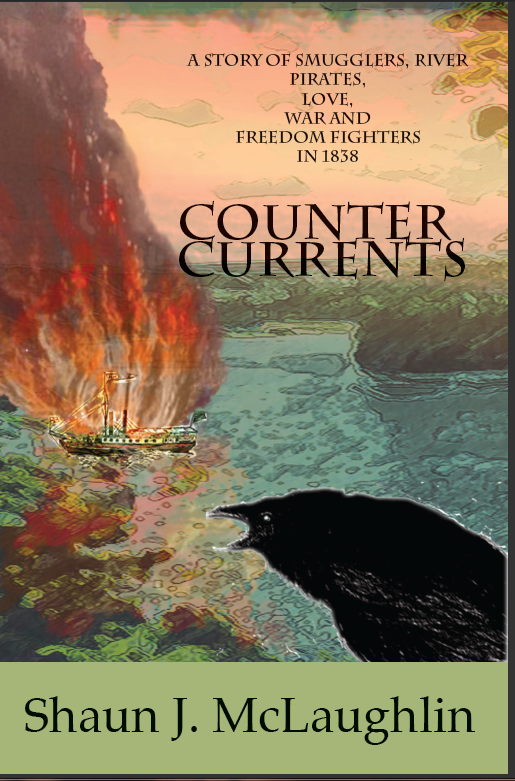 My self-published novel, Counter Currents, is a story of smugglers, river pirates, rebels, love, and war. Most scenes are set against the grandeur of the Thousand Islands during the drama of North America’s forgotten war, the Patriot War of 1838. Among the raiders was Bill Johnston, the Thousand Islands legend. The protagonist, Ryan, a young immigrant, is drawn into Johnston’s world of piracy and secret societies. Ryan falls for Johnston’s daughter, Kate. Tugged by the opposing currents of romance and war, Ryan struggles to reconcile his troubled family history, his duty and his heart. Counter Currents is history illuminated by fiction. I worked as a writer – journalist and technical writer – for over 30 years. Since my teens, I wrote fiction on the side. For my first novel, I queried dozens of agents and publishers in Canada and the US. Over half never responded. One small publisher in Iowa offered to publish it, but they closed down shortly after I signed the contract. Weary of rejection, I studied the self-publishing arena and the related technologies, and made a decision to be my own publisher. I do both. In the same month (March 2012) that I self-published my first novel, my first history book, The Patriot War Along the New York-Canada Border, was published by South Carolina-based The History Press. It covers the eastern half of the Patriot War of 1838. There is an interesting story behind that. I created a history blog in January 2010 in advance of my novel to help promote the book and the era. An editor at The History Press discovered the blog and asked me to write a book about it. I said yes, of course. I am astounded at how simple it is to be self-published. Between Smashwords, CreateSpace and Kindle/Amazon, anyone who can follow step-by-step instructions can produce books in multiple formats. There is no barrier to publishing. Technology has sidelined the gatekeepers and unleashed writers. You’ve got to love that. I have tried most of the popular marketing techniques: blogging, Twitter, Facebook, and guest posts on other blogs and e-magazines. I had both books reviewed, and even paid for an ad on Goodreads. My history blog, raidersandrebels.com, is the most successful. It gets over 600 visits per month from history lovers. The key is to provide readers with free, interesting content. That blog links to my imprint blog where I describe my books. A small percentage of visitors become customers. Two history articles that I wrote for the Thousand Islands Life e-magazine early in 2012 did well, as did a book review on that mag. The magazine’s audience is in the heart of the region where both my books take place. The exposure led to a regional spike in sales, especially for the history book. My research into the business of self-publishing taught me that my book is one of millions available. It is one leaf in a forest of 10,000 trees trying to be noticed. You cannot be in this business for the money. Like a painter or musician, you must be in for the art. Next time I will spend no time trying to find a publisher for my fiction. From my observation, the authors that succeeded financially did not hit the big time with their first book. They built up a fan base, good book by good book, until they broke out. In brief: write well, write often, be patient. I have a detailed outline for the sequel to my novel. It will be set partly in Australia, which I will visit in the fall of 2012 to scout locations. I plan to research a second history book on the Patriot War to cover events along the western front. I write about history (and by extension, historical fiction) like a good journalist covers current events: how people face their trials and triumphs never gets dull. My publishing imprint has info on both books: raidersandrebelspress.com.